Sarah practises Pilates and massage both for remedial and fitness purposes. She trained with Body Control Pilates and Body Pilates Europe and she teaches both disciplines on the mat and on studio equipment; Reformer, Cadillac, Spine Corrector, Combo Chair. 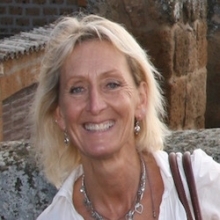 Sarah has worked with Chiropractors and Osteopaths, in Sports Clinics, Health Centres, Hospices. Massage has the most healing and rejuvenating affect on the body and is used to help heal injuries as well as help both the mind and body in times of stress and grief. Sarah's clients range from those with muscular-skeletal & neuromuscular problems, back pain, sports injuries and degenerative illnesses to those requiring rehabilitation following hip and knee replacements. She helps new mothers regain their figures as well as a large number of clients who want to gain a good level of general fitness. “I firmly believe that exercise is one of the key factors to keeping younger for longer and helps both the body and the mind”. "You’ll notice that older people who are in good health nearly all do a moderate amount of exercise". As Joseph Pilates said, “Who feels the youngest? A twenty year old with a stiff spine, or an eighty year old with a flexible spine”? “I’ve always loved the feeling that you get from exercise. I have more energy, get less tired and my body generally feels stronger and more flexible." Sarah has three children and lives with her husband in Cornwall. She loves Lindy Hop dancing, travelling, cooking, theatre, running, walking, learning Italian and of course Massage and Pilates! My wife persuaded me to start Pilates with Sarah. I'm 71 years old and never done a days exercise in my life. Sarah's sympathetic and sensitive approach has given me the confidence to continue and both my mobility and fitness have improved. Pilates has made such a difference to both my suppleness and muscle tone. My daughter has noticed how my posture has improved. I try and do a bit most days. Sarah is an extrememly gifted Pilates teacher with a great eye for detail and a profound understanding of how the body works.